My son requested a Lego Brick Birthday Cake for his 9th birthday, so off to the internet I went to get some ideas and “how-to” tips. Because he gave me 2 days notice, I purchased a 12 x 18 slab from the grocery store. We had watched the Betty Crocker video but he felt the bricks weren’t high enough and so I bought the slab to get the proper height. The slab made 4 large bricks or 3 large and 2 small (although I lost one small brick in my trial run). I first tried poured fondant and it was a complete disaster! I should have taken a picture to start a “what not to do” section for this website (LOL). Since I have never made (or used) fondant before I opted for the pre-made tubs. I used Duff as I heard the Wilton brand wasn’t very good. The red was an exact match to the colour on the lid, but the blue fondant was lighter inside than it was on the cover. So I got out my disposable gloves and kneaded in some Royal Blue gel colour to get it closer to Lego blue. I gave each brick a crumb coat and put it in the fridge to set for 15 minutes. 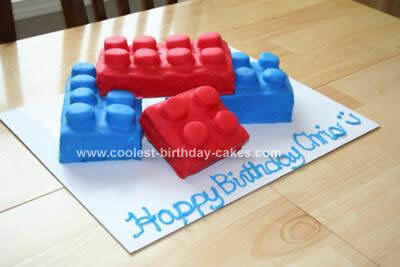 I used marshmallows cut in half for the “knobs” and attached them to the bricks with icing. Then I rolled the fondant (which was REALLY easy to work with) and placed it over the bricks and marshmallows. I used a soft, pliable baby spoon to smooth the edges and get in between the marshmallows. We had pre-determined the stacking pattern, so I omitted the marshmallows in the areas where the bricks were to be stacked. I was very impressed with how easy it was to do and I think next time I’ll make my own fondant!